Winter has come, and this year you’ve decided to initiate your child to the joys of downhill skiing! So how do you best go about this? We answer your questions about this activity so that you can get your little one started off safely and properly while having fun. 1. At what age can they start skiing? When a child has mastered walking, they’re ready to learn to ski, plus it’s ideal if they first demonstrate interest on their own. This desire often appears around four years old. It’s always best to sign them up for courses, even if they’ve already gotten a head start on skiing and reached a good level. Your little skier will quickly acquire the right foundations, plus it’s always inspiring for children to learn with their peers. The ASSQ has put together a free program so that children can try out skiing or snowboarding in the company of qualified trainers. This way you can test your child’s taste for these winter activities with no commitment or expense on your side. Your little athlete will learn how to use the magic carpet to get around the slopes, carve their first turns and discover the thrill of skiing on snow. For the parents, the Expérience maneige program is a great opportunity to assess their child’s interest in skiing or snowboarding. To find the Expérience maneige sites nearby and the dates of the tour, visit maneige.ski. 2. Should I pressure my child to take up skiing? Certainly, if your goal is to turn your little athlete off skiing, then go ahead and pressure them. Children, in particular, are not attracted to an activity unless it promises a fun and joyful dimension. Make sure he or she really wants to take up the sport, even if you have to wait a year or more. If they’re scared, they risk learning poor technique and failing to get the hang of it. Arrive 45 to 60 minutes before the start of the course to leave time for your child to get to know the place. Be positive and point out to them other skiers having fun. Don’t hesitate to tell them the goal of this moment is above all their own personal pleasure: fun is essential to appreciating skiing. 3. How long should the first lessons be? Children’s first descents should always take place in the context of a course given by a certified ski monitor trained to teach the sport to children. The monitors are there to ensure that kids have a rewarding experience. Don’t hesitate to call up the ski hill, as the employees can suggest the best training for your child depending on their age and preferred learning method. Ski school, however, can introduce a lot of new concepts for a kid to absorb at once. A course of an hour maximum is a good idea, as a child doesn’t have the time to get cold or worn out. 4. 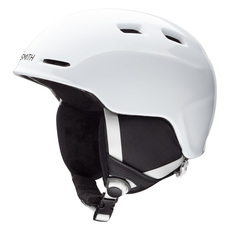 Is a helmet indispensable for my child? Their heads are still fragile and their first experiences on skis will no doubt be punctuated with falls and wipe-outs. So of course a helmet is the right choice, and make sure it’s adjusted well so that it stays snug once attached. 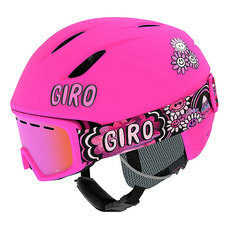 To find the right size helmet and goggles, have your child try them on then simply choose the most comfortable. You can also calculate their head circumference and compare it with the guidelines on the box. The important thing is to select the helmet first then make sure that the goggles fit both the face and nose well. For their first outing, you can borrow a friend’s equipment or rent it at the ski hill. This way you don’t make an investment until you know if skiing works for you and your kid. For children starting out, a flexible boot is a good choice as it’s easier to carry out movements and turns in them. 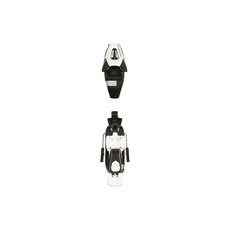 The stiffness of the boot can gradually be increased when they grow and gain experience. Of course, it’s essential that they try the boots on before you buy them. 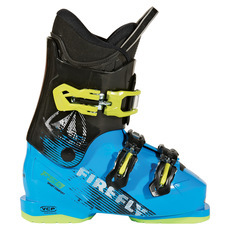 Don’t count on shoe size to determine ski boot size. To determine the correct size, remove the liner and sole from a boot, then place your child’s foot on it, aligning their heal to the rear extremity of the liner. The sole must not extend beyond the end of the foot by more than one to 1.5 cm. A beginner more easily masters skiing on short skis because they are more maneuverable. They’re also easier to find, so your kid can quickly have fun and learn to appreciate the sport. If your child is growing fast, we’ve got the solution with our exchange program that lets you recuperate 50% of the value of the junior equipment you’ve bought when you come back and exchange it in the fall. To choose the right size skis, place a ski standing up in front of your child: it should reach up to the chin. With time and increasing skill, the ski length can go up to eye height. Traditional bindings are screwed onto the skis, meaning the skis must be drilled into to attach them. 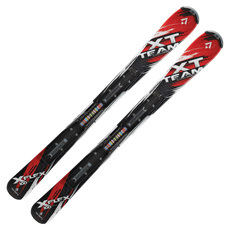 They often cost less, but when it comes time to change boot size, the skis and bindings will also need to be replaced. Rarely requested by customers, traditional bindings are not often in store. System bindings are attached to the skis by rails so that they can vary in size up to a certain point. 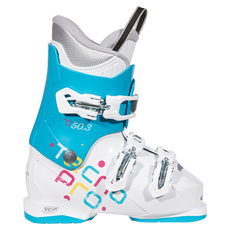 When the child goes up a boot size, they can keep using the same skis, making this the option we recommend. 6. 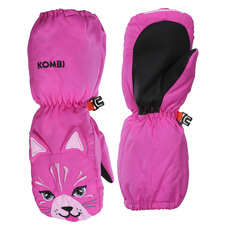 How do I gear up my child against the cold? The accessories (snow suit, mittens and tuques) are very important in skiing because if your little one is cold, they may get discouraged. Make sure they’re suited up in clothing that’s appropriate for downhill skiing, for example, gloves or mittens that are specifically meant for skiing, and be sure their ears are always covered. A children’s balaclava does a great job of this. Children should wear just one pair of socks, as two pairs can create fiction and fail to evacuate moisture. 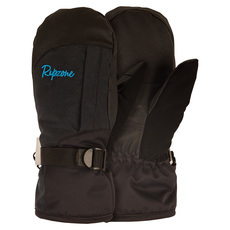 Choose synthetic fibre socks designed specifically for skiing and snowboarding, up to knee height. Avoid cotton at any cost. Ski poles can wait because it’s better for children to learn without them. Why? Poles can make skiing even tougher for young beginners, and they can be dangerous during wipe-outs. Kids should first get used to skiing with their arms free. 8. Is the winter sun dangerous for my child? There’s nothing better than skiing on a sunny day! However, it’s important not to forget that the sun’s reflection on the snow can cause serious damage to the eyes and skin. So invest in a good pair of goggles meant for winter sports as well as high-index sun cream. Some helmets also have winter goggles integrated. 9. Can kids take ski lifts? Unfortunately, no. Your beginning child must not use the ski lifts or T-bars, even if you accompany them. It’s better for your little one if they use the ski school’s magic carpets. With these carpets, kids can test their balance safely, plus they’re specially designed for children. What are the essential exercices to learning to ski? The snowplow is the most important move for a child to learn, for safety’s sake. It involves making a V-shape with the tips of their skis, like a slice of pizza. The wider the V, the more effective the braking. It’s an easy move to carry out, even for little skiers, and it allows them to slow down the slide and avoid running into obstacles or other skiers. When your kid has more experience, they can learn how to brake with their skis parallel, like the big kids! The choice of equipment and accessories and a good method of learning are the key elements to encourage a passion for skiing in children, while also ensuring their safety. Soon enough, the sport will offer hours of fun for all the family!